Last week, at the supermarket, my 3 year old daughter picked up a ready mix bag of bake your own cookies. Of course, as a mother striving for perfection, I said no. Personally, I don't see the point of buying a ready mix bag of cookie mixture when we have the ingredients to make them from scratch at home. 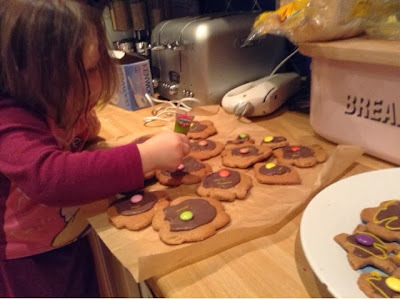 So instead, following the meltdown because I dared to say no in a supermarket, I promised that we would make our own at home and we picked up some chocolate beans for decorating the biscuits we would make. Yesterday, we got busy in the kitchen. 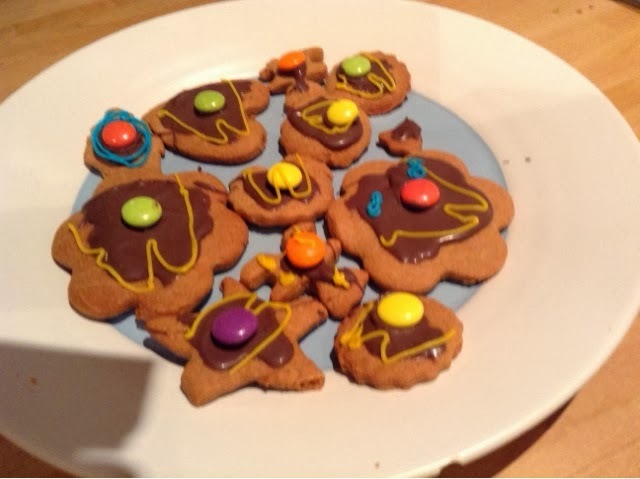 As it's nearly Christmas, I decided to make gingerbread. Partly because if the cookery session was a success, we can make more next weekend and use them as gifts for their teachers and childminders, and also as tree decorations. All the children wanted to get involved so I tried to adapt different tasks to their skill level. I asked the 6 year old to help me measure out the ingredients, using his number skills to let me know how much we would need by using the scales. We started by sifting together the flour, bicarbonate of soda, ginger and cinnamon into a big mixing bowl. The 3 year old used her spoon to vigorously push the ingredients through the sieve into the bowl and also onto the table and floor. I then added the softened butter and all three children enjoyed rubbing the ingredients through their fingers to make the mixture into a breadcrumb consistency. Meanwhile I beat the egg and golden syrup in a separate bowl before adding it to the mixture and stirring it into a dough. We wrapped the dough in cling film and popped it in the fridge for 15 minutes. While the dough was firming up, we lined three baking trays with grease proof paper and washed up the bowl and spoons. I then set the 3 year old the task of sprinkling a generous amount of flour onto a big wooden board so we could roll the dough out. We then took turns to cut shapes out of the dough and pop them on the baking trays. Even the 17 month old enjoyed making the shapes after watching his big brother and sister show him how to do it. The trays were placed in the oven for 15 minutes and then the biscuits were cooled on a wire rack. Now for the fun bit. 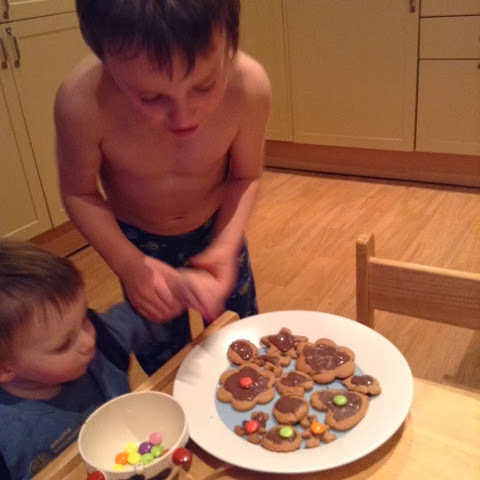 Decorating the biscuits. I melted some cooking chocolate and then let each of the children spoon and spread some on their biscuits. We then added chocolate beans (not the type that rhyme with parties due to my ongoing boycott of their manufacturer - more to come on that in a post later this week). 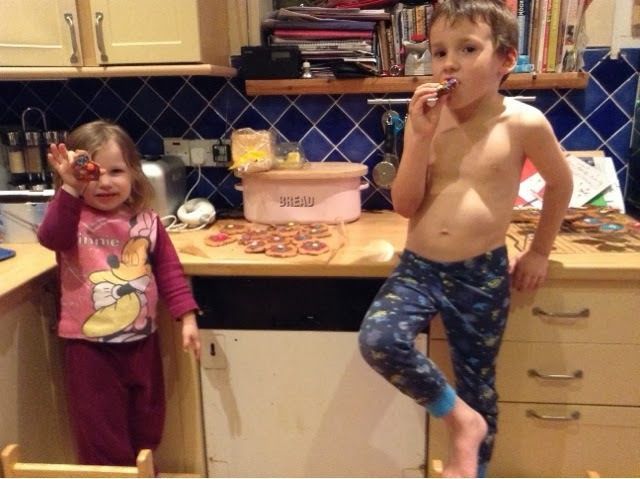 Once the chocolate had cooled, I armed the older two with some small writing icing pens and set them loose to decorate however they liked. I don't normally make a habit of cooking with the children. It's on the list of things I would like to do more often, but that I don't generally have the patience for. At the end of a busy day, the kitchen is often my sanctuary where I can focus on the task at hand. But after making the biscuits, I think I'll try and involve them more often. It's rare to find an activity that all three (aged 6, 3 and 17 months) can enjoy at the same time. It certainly helped to give them individual responsibilities - and their own trays. But, yes, we'll be making more next weekend and I suspect some will be made as gifts. Because, thankfully, they definitely passed the taste test. And if you do receive one - I'll make sure I remember to get them to wash their hands first - next time.